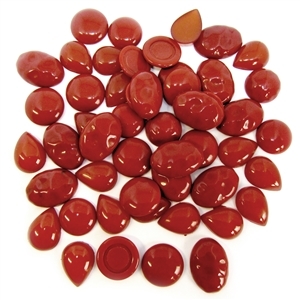 Assorted ruby red stones, flat back, Italian lucite. Flat back stone, lucite, oval, round, cabochons and tear drops. Faux ruby red stones. Measuring from 18 to 25mm. Beautiful assortment to play with. There are no two lots exactly the same. Over 2 ounces. Sold by about fifty (50) piece lots.